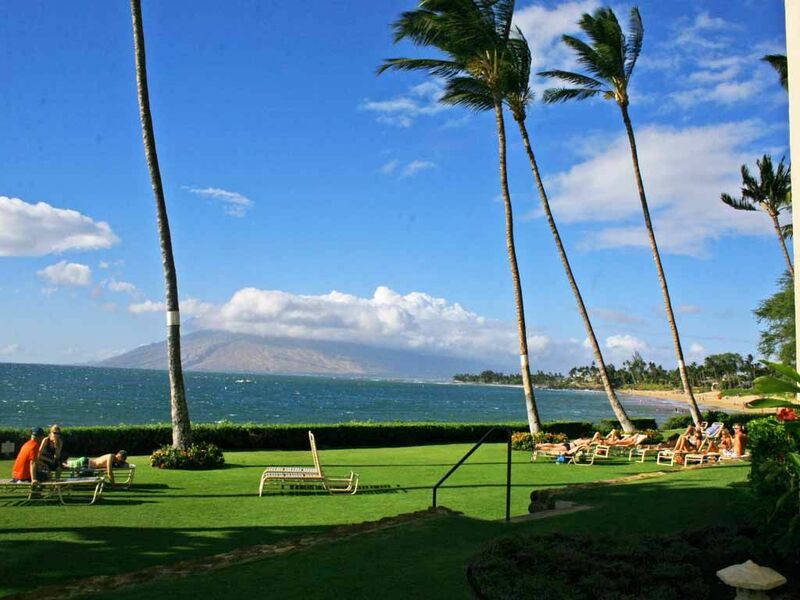 Enjoy the spectacular view of the Pacific, the outer islands & the majesty of the West Maui mountains from Royal Mauian's most spacious & luxuriously appointed two bedroom suite. This suite offers a direct oceanfront vista and is literally just steps away from one of Maui's best spots to take a refreshing swim with the turtles. Open the lanai to let the warm tropical winds rejuvenate you or enjoy the elegance of the suite in climate-controlled air conditioning…the option is yours. When it’s time to just hang loose in the suite, you’ll have all the comforts of home including two flat panel Plasma TVs, free WiFi, and a kitchen with everything you need to delight your party with a culinary masterpiece. The Royal Mauian also offers a unique opportunity to barbecue & enjoy a breathtaking sunset from its rooftop dining area. This spacious common area provides an amazing panoramic view of Haleakala giving way to the stunning cerulean expanse of the Pacific. A multitude of sporting opportunities abound as well, with championship golf & tennis just a short drive away, paddle sports, scuba & snorkeling surrounding you, and sailing adventures departing daily from right around the corner. This condo is beautiful! Great location with everything you need to enjoy your stay! The condo location is great, restaurants within walking distance and a beautiful beach. Very clean and well appointed. Watching the sunset from the lanai or the rooftop deck was amazing. We did a couple day trips and there was a cooler for our use, they really thought of everything! Highly recommend! Close to the beaches. Ground floor unit with air conditioning. We stayed here from June 10 to the 16 2018. This was our second stay at this unit at the Royal Mauian, our first time being 5 years ago. We have stayed in two other units in this complex before but we liked this one the best so we decided to get this one again. I was not impressed this time, however and I would appreciate it if the owner of the unit would contact me to discuss it. The unit over all was fine but there were some details that could easily be addressed that would make it far better. I won’t write about them here, as I believe that this is a good unit still and I don’t want to sway any ones decision about it if they are thinking about renting it. The one major problem we had was with the dryer in the unit not working. But the manager for the unit was very prompt at finding a solution and even getting it fixed very quickly(2 days) which was very impressive. If the owner reads this, I hope that you will contact the manager and get my information. Then call or email me and I will be happy to talk to you personally about your unit. Overall though, I don’t think that we will be back to this condo, which is sad to us because we always loved coming here. Beautiful condo with such a warm feeling. Bedrooms and bathrooms are so nicely appointed. The view of the ocean is amazing and expansive. The lawn from the lanai is so beautiful. The pool is perfect and nice on windy days because it is protected by clear panels. Couch Hide a bed is comfortable enough, above average. Mahalo! Conviniently accessible to stores, restaurants, and to two beaches. We enjoyed our stay and found the ground level unit offered us easy access to the pool, and stepping out on the grassy area to watch the sunsets. The unit was well equipped. We would stay in this unit again. Stayed in a great unit in the Royal Mauian again. Have stayed there over 20 times in the past 30 years and have always had a great time. What a wonderful unit. We really enjoyed having a first floor condo for the first time. The unit was clean, well decorated and very well supplied. We would stay here again, no doubt!